Greater Klang Valley, Kota Kinabalu, Sabah, as well as the booming Iskandar Malaysia, Johor. The Civil Engineering and Constrution division of WCT Holdings Berhad is proncipallt involved in civil engineering works. Its expertise covers F1 racing circuits, airports, dams and water supply schemes, expressways and highways, civil works, interior fit-out works and buildings. Established in 1996, WCT Land Sdn. Bhd., is the Property Development, Management and Investment Division of Bursa Malaysia listed WCT Holdings Berhad with a presence in Greater Klang Valley, Kota Kinabalu, Sabah, as well as in the Iskandar region, Johor. 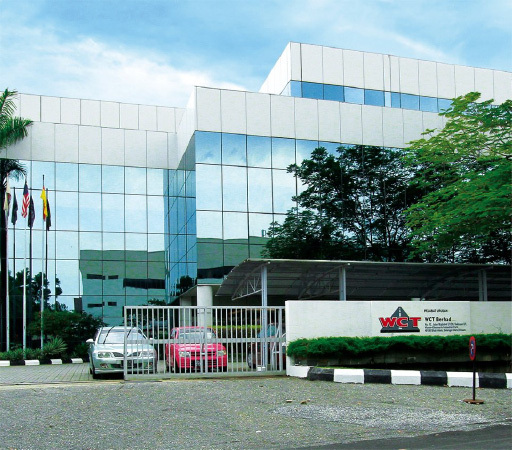 WCT Holdings Berhad is principally an investment holding company which provides management services to its subsidiaries and associated companies. Its two main subsidiaries are WCT Berhad and WCT Land Sdn Bhd (WCT Land) which are primarily involved in engineering and construction, property development, investment and management activities. WCT has indeed grown from its original engineering and construction business over the last 32 years. Today, it is one of the notable township and property developers in Klang South with its maiden township development in Bandar Bukit Tinggi. Going beyond Klang, WCT has spread its wings to Kota Kinabalu, Sabah and Iskandar Malaysia, Johor and has also ventured into property investment and management as well. The company’s property development, investment and management portfolio includes townships, luxury homes, high-rise residences, industrial, offices, mixed commercial developments, concessions, hotels and shopping malls. To date, WCT Land has delivered in excess of 15,000 units of residential and commercial properties amounting to a Gross Development Value (GDV) of RM4 billion. Moving forward, WCT continues to seize suitable opportunities for quality land acquisitions in Klang Valley, Iskandar Malaysia, Penang, Kota Kinabalu and Vietnam to support further expansion to the property portfolio and expand its Paradigm Mall and Première Hotel brands.